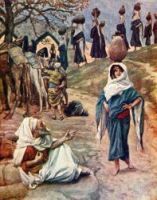 The Rebekah Bible story continues with her long journey with Eliezer. As they approached Hebron, she was on watch for her promised husband. So she was the first to see a stranger approaching along the road. It was Isaac, who had come to meet Eliezer. When Rebekah learned who the man was, she dismounted from her camel and covered herself with a veil. Soon after, Rebekah became Isaac's wife, and he loved her. Rebekah had to wait a long while for a child, but at length two sons came to her at once-- Esau and Jacob. These Rebekah Bible images are from my collection of old books. Feel free to use these Rebekah Bible pictures in your artwork. Click on the Rebekah Bible illustrations below to see more details about saving a free drawing of Rebekah from the Bible or about purchasing the Rebekah Bible images at a higher resolution.